During a recent filming trip for the new luxury hotel TV show, Great Escapes, I spent 8 days exploring San Diego, CA visiting some of the best hotels the city has to offer! The trip took my Producer Morgan and me to the center of San Diego’s Gaslamp Quarter to the 35-room boutique hotel called The Keating. 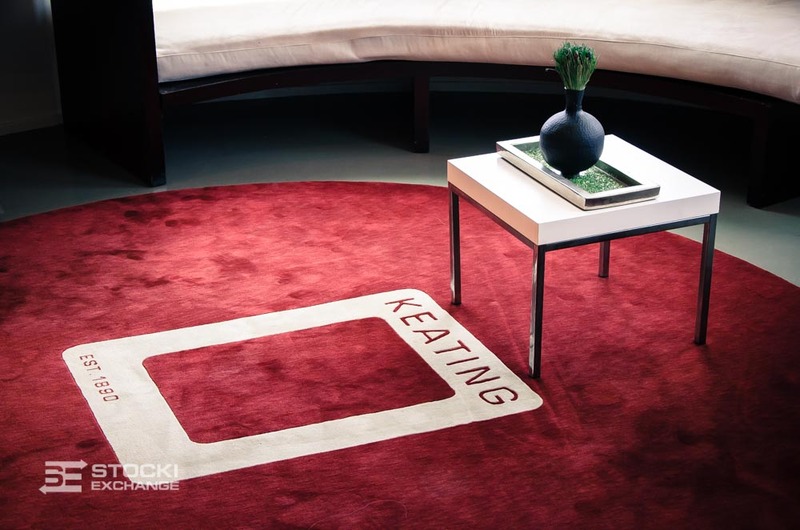 Check availability & make a reservation at The Keating Hotel in San Diego, CA! Book directly with the hotel to avoid the Boutique Experience Fee of $22.59/night. Request a corner room for a bit more space. Request a higher floor if you’re planning to head to bed early. Dine at Cafe 21 at least once during your stay. 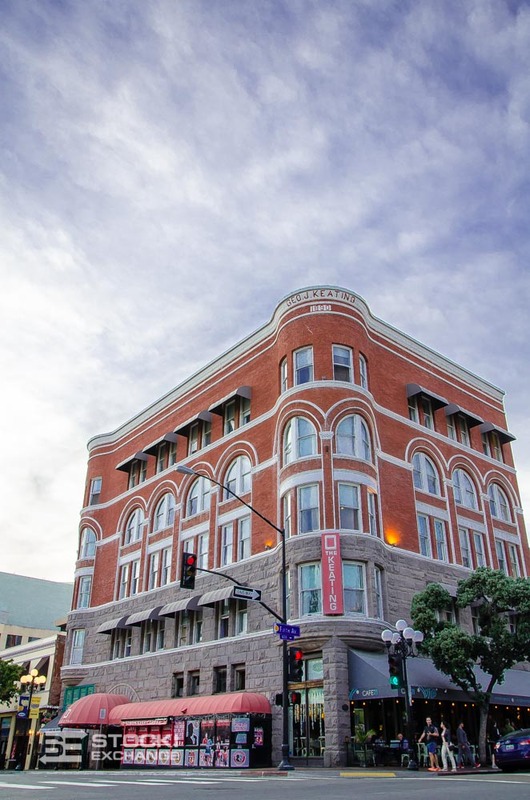 Nestled in the heart of the Gaslamp Quarter, The Keating building was built in 1890 and was the first building in San Diego to have an elevator. Originally constructed as an office building, prior tenants include many well-known businessmen of their day and even the San Diego Trust & Savings Bank, where the original bank vault still remains today. Eventually, the building was renovated by Pininfarina, the Italian design team responsible for Maserati and Ferrari, which is reflected by the black, white and Ferrari red throughout the hotel. 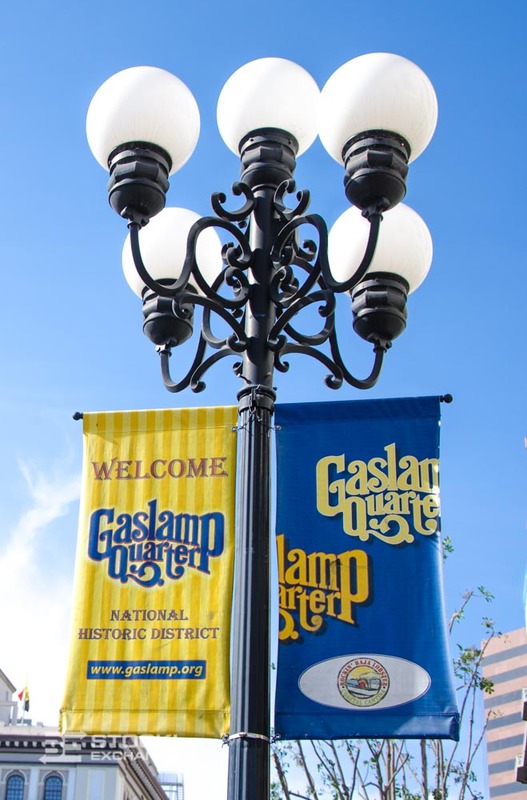 The Gaslamp Quarter is one of the most highly saturated places for restaurants, bars, clubs, and entertainment. Think of a cuisine and you’re bound to find someone serving it up within walking distance of The Keating. Located just a few miles from San Diego Intl. airport, you’ll be out and about exploring the city in no time. 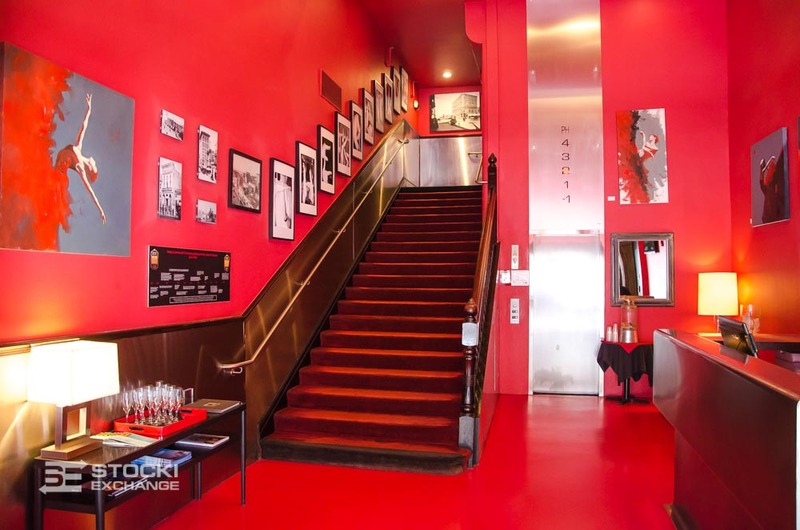 The lobby is a shockingly bright red color and definitely makes an impression when you arrive. The lobby and hallways have many historical photos of the hotel throughout its history. With just 35 rooms in the hotel, each is a unique creation from the designers and boast amenities such as massive Morpheus Jacuzzi Tubs, a Fresca Spa Suite with an outdoor jacuzzi area, and The Macallan Suite that was designed by the Scottish Whiskey Distillery. All rooms feature luxury fixtures including Bang & Olufsen entertainment systems and high-def televisions, Lavazza espresso machine, walk-in rainfall showers, and Frette Egyptian cotton sheets. My suite was massive and decorated with a modern city-chic feel to it. Super comfortable furniture, separate bedroom with a towering walk-in rainfall shower, and dining room table with great views of the city. I’d recommend requesting a corner room as they have a rounded bump out due to the structure of the building and a higher floor as the live music at Patrick’s, the Irish Pub next door, can get a bit loud at night. If you’re planning to be out party rockin’ all night then it doesn’t matter! While each of the suites is quite unique, the packages they offer will really let you have a one-of-a-kind experience. Living like the superhero won’t come cheap though. This package is $10,000 per night and requires a two-night minimum. If you’re more of a Batman fan, you can try the “Live Like Bruce Wayne” package which has you cruising around in a 2015 Ferrari California, VIP club access to OMNIA San Diego, and a bottle of Macallan 12 for each night! Again, it’s 10 G’s a night and you gotta stay two nights. For those of you who are ballin’ on a budget, expect to pay $175-300/night. 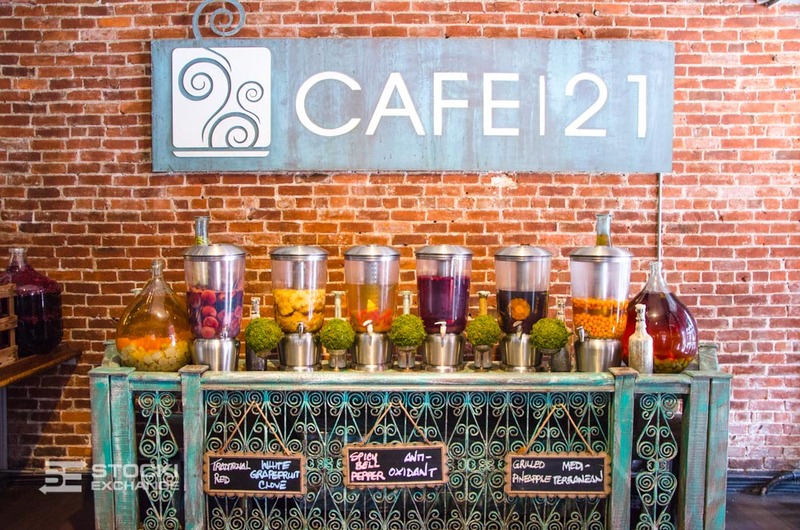 Restaurants & Bars – Cafe 21 is a must-try! 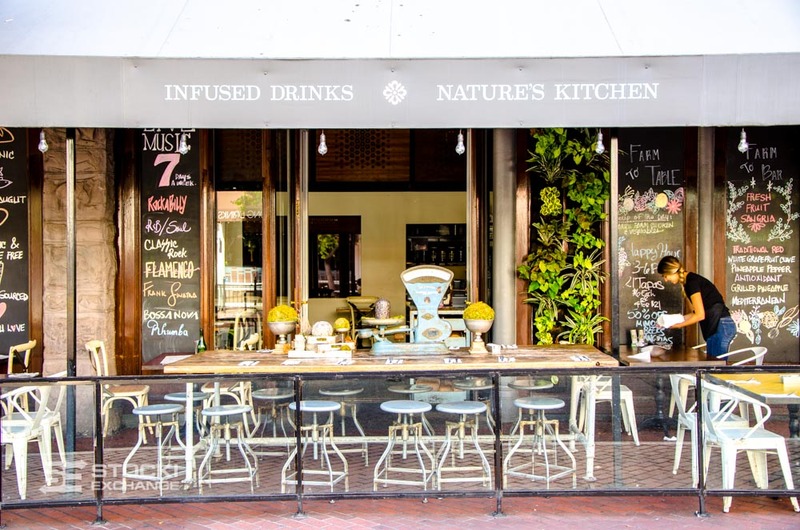 While the hotel doesn’t have its own restaurant or cocktail lounge, don’t worry, the Gaslamp Quarter is flooded with endless options for you to try. During my trip, we visited Cafe 21, which is built into the ground floor of The Keating just around the corner from the hotel entrance. YOU MUST EAT HERE. This place has something for everyone and takes the whole fresh/local farm to table movement to the next level. 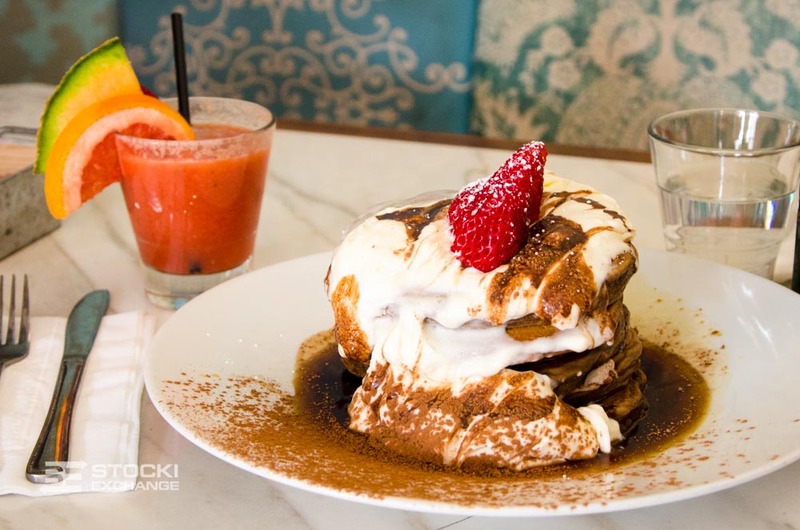 They have a variety of homemade sangrias brewing as you walk in, a live garden wall behind the bar, and a brunch menu with items such as TIRAMISU PANCAKES. These things are absolutely insane. Made with espresso syrup, mascarpone cream sauce, topped with a chocolate drizzle and powdered sugar. 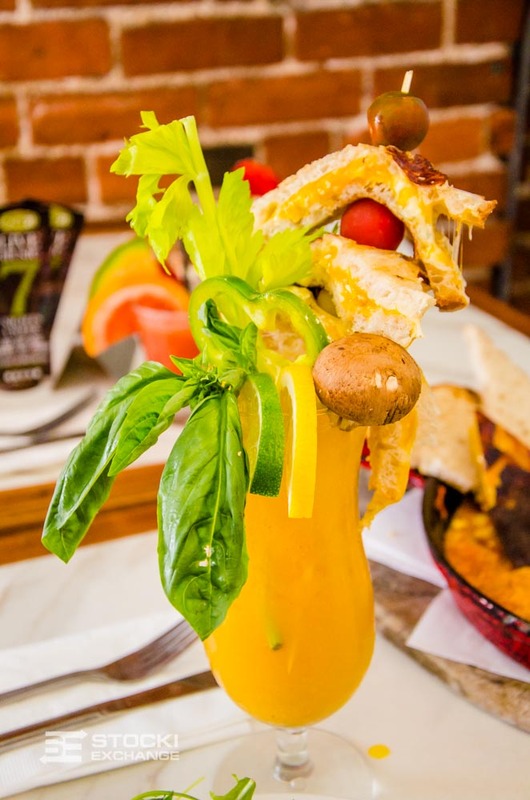 The next must-try is their signature bloody marys. Choose from traditional red (Classic Mary), or the Ol’ Yello’ Mary which is made from fresh yellow heirloom tomatoes, skewers of pickled veggies and a GRILLED CHEESE! Looking for a little spice? Try the California Greenin’ which is their house-made Tomatillo mix, a mix of more fresh veggies, and of course a grilled multi-cheese sammy! My other recommendations include the three-floor bar directly opposite the hotel called The Tipsy Crow. The upstairs speakeasy-style lounge is super unique and if you’re looking for a bit more actions, head downstairs to The Underground for dancing and DJs. Stone Brewing tap room is just a few blocks away from the hotel in the shadow of Petco Park, the home of the Padres. Delicious flatbread pizzas and salads, and of course plenty of their tasty suds to wash it all down with. I tried the Italian Sausage pizza and it did not disappoint! 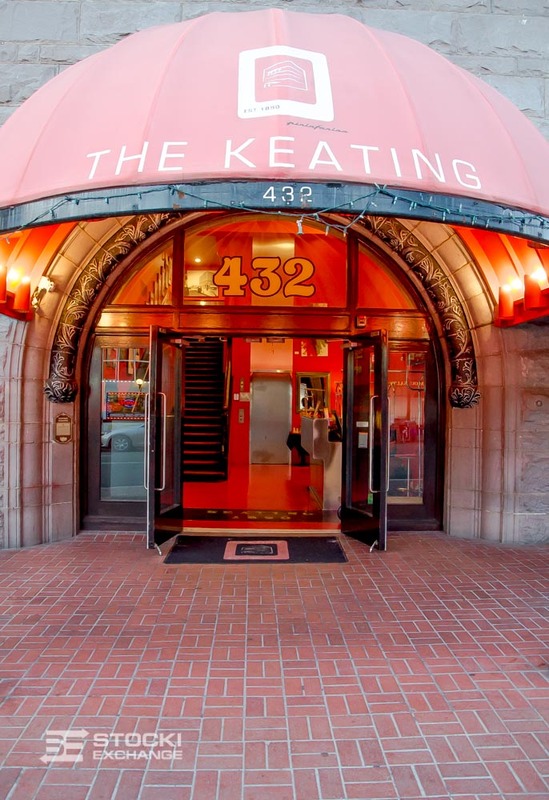 If you’re looking for a hotel with a lot of character and the perfect downtown location, The Keating is your ticket. My suite was huge and I almost feel bad because I didn’t spend too much time in it as we were out exploring the Gaslamp Quarter! 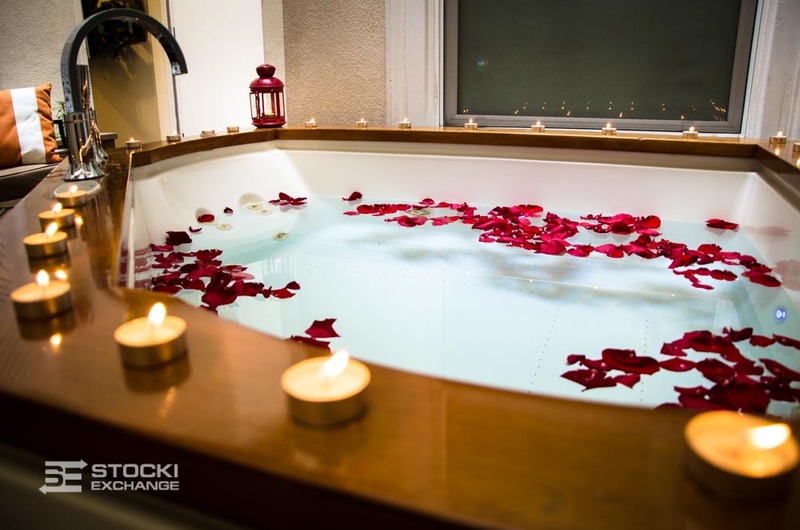 If you’re looking for a bit of daytime relaxation and non-stop nightlife, make sure you book the Fresca Spa Suite. Spend the day in your private open-air atrium with a whirlpool Jacuzzi, alfresco steam shower, and an in-suite massage. After that, you’ll be ready to hit the town all night. 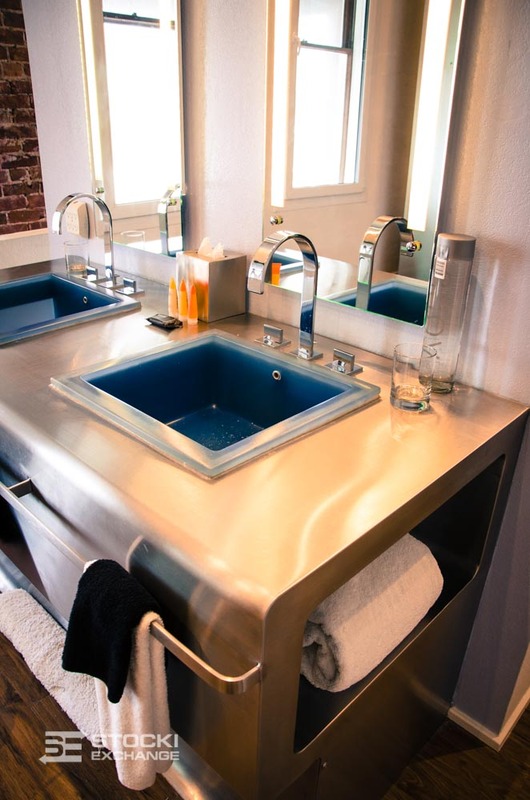 Overall, it’s a great little boutique hotel in the heart of San Diego, super close to the airport, just a short walk to the marina where the huge cruise ships come to port and surrounded by endless restaurants, bars, nightlife, and entertainment!